After our little detour via the wet markets, @eatnik and I headed up the hill to the ruins of St Paul’s. Not really because we wanted to see the ruins – I’d seen them twice before – but more because I wanted to show @eatnik the wonder that is Jerky Street, which leads up to the historical church facade. Jerky street (Rua de Sao Paulo) is lined with, well, jerky vendors. Predominant here is the bak gua style of jerky, though you can find the other ‘dried beef’ style too. Along this street, you can also find many almond cookie shops, and shops selling Portuguese egg tarts. It’s all very touristy, but in a tasty way. After sampling our way up and down Jerky street, we wandered back down to Senado Square, and headed for Won Chi Kei. 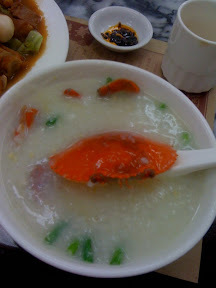 Again, this was another recommendation from Petite Crystal, who posted about a crab congee. As a self-respecting Chinese man, I could hardly bypass that! The place was pretty easy to find – it’s right opposite the McDonald’s – but we weren’t sure as we walked in if it was the right place, mostly because the ground floor seating is pretty limited, and I was under the impression it was a pretty big place. But there’s more seating upstairs. You’ll still probably end up sharing a table with strangers if you’re less than a group of four, however, because it’s pretty busy. I guess the crab congee’s no secret, though Wong Chi Kei is pretty well known for its noodles too, apparently. While we waited for our food to arrive, @eatnik and I sampled the chilli oil, something that was fast becoming a team #fatty habit. 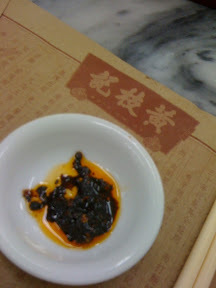 We were most impressed by the chilli oil here. It was salty and smoky, with a nice slow burn, but not too much initial heat. 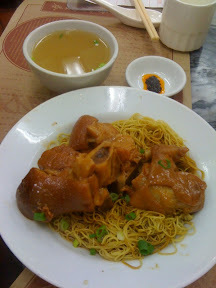 @eatnik had the gon loh mien (dry-style egg noodles) with pig’s trotter. She wasn’t too impressed with the dish, and having tried a bit, I don’t quite understand where Wong Chi Kei’s reputation for noodles comes from. It was pretty lacklustre. And the pig’s trotter, though it had good flavour, was a bit on the tough/dry side. When the bowl of congee came, it didn’t look like much. The crab was almost completely submerged, and I had to dig around before I found any of its bright orange shell. There was what I’m pretty sure was an entire miniature crab in this bowl. There’s not a lot of meat going on, and it was pretty fiddly, but the crab meet was wonderfully sweet. The good thing about crab as a main dish is that you can go in with you hands; it’s a little more difficult when there’s no plate, and you don’t want to get hot congee all over your fingers. The congee itself was nice and smooth. Years ago, a friend told me one of the secrets to good restaurant-quality congee: evaporated milk. It makes the rice porridge smoother, and well, more creamy. 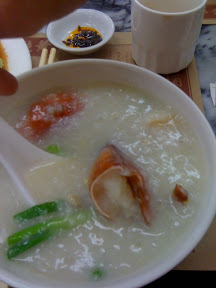 I’m not sure whether Wong Chi Kei use evaporated milk, but the congee was certainly very smooth and creamy, with that tendency to stick to your lips which good congee has. Eyes bigger than our stomachs – read greedy here – we also made the mistake of ordering the ‘Eight treasures’ – what looked on the menu like a mixed entree platter. And it was, after a fashion… though there was nothing fried about this mixed entree selection. 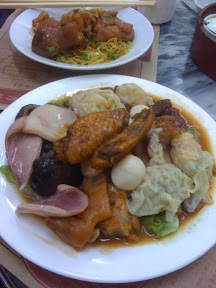 Instead, it was a selection of braised and boiled items, pretty much all of which you could order with noodles. Chicken wings, shiitake mushrooms, sui gao, wontons, cuttlefish, and more of that not-so-great pig’s trotter. In the end, in a performance heaped shame upon my family, and would have saddened my mother to tears, we managed only to eat about a quarter of what was on this combo platter. I felt very guilty leaving that much food as we left. Lolz, also captcha was "chewin" – zomg so apt!